Medical Marijuana: Prescription for What? People in Florida are signing up for medical marijuana ID cards in record numbers. But the NBC 6 Investigators had a difficult time finding out what conditions doctors are prescribing the drug. NBC 6's Dan Krauth reports. People in Florida are signing up for medical marijuana ID cards in record numbers. More than 3,000 new patients are registered every week. 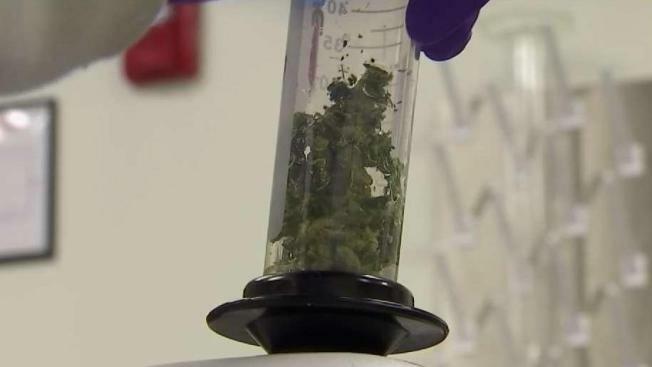 But the NBC 6 Investigators have had a difficult time finding out the conditions doctors are prescribing medical marijuana. In order to receive an ID card, a patient must visit a registered doctor who is allowed by the state to prescribe marijuana. At Miracle Leaf, a medical marijuana doctor's office in Wynwood, there's a reason they have two telephones at the front desk. They're ringing constantly. Dr. Tommy Louisville works at the Miracle Leaf clinic in Wynwood. Over the past year, he has prescribed more than a 1,000 patients with marijuana. "It has been busy, a lot busier than I expected," said Dr. Tommy Louisville. "It was something that the public wanted and something the public actually needs." Dr. Louisville has prescribed more than a 1,000 patients with marijuana over the past year. He says, he often has to turn patients away. "It's not hard to weed out the bad seeds," he said. NBC 6 Investigators tried to find out what conditions patients who sign up for prescriptions. But the Florida Department of Health, the agency that runs the program, first said they won't release the information. A spokesperson told NBC 6 numerous times in calls and emails that it's "protected" information under the law. Even though, more than 20 medical marijuana states across the country, from New York to Hawaii, release the information. NBC surveyed the 32 states where medical marijuana is legal. In more than 20 of them, state officials release data about the patients’ medical conditions. "It quite frankly doesn't make any sense," said Jorge Silva, a medical attorney and professor at FIU. "There really is no legitimate reason for the state to withhold this information." Rep. Rene "Coach P" Plasencia, R-Orlando, debates on the House floor in 2015. The information was withheld until NBC 6 Investigators reached State Representative Rene Plasencia, R-Titusville, who wrote the bill. He told us that the Department of Health has a mandate to collect the data and provide it to state legislators. The next day, a spokesperson with the health department called back saying they will release the conditions after all, but not until sometime later this year. The spokesperson also said their initial denial of our request was a misunderstanding.